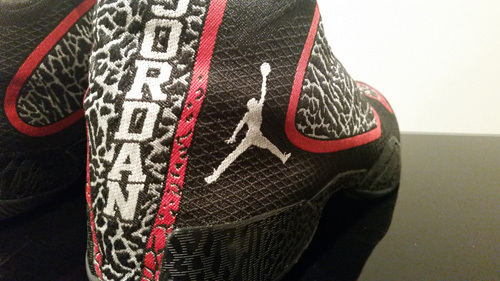 Some have called the Jordan XX9 the most technologically advanced Jordan shoe ever. From the spec sheet alone, they’re probably right. With a completely new woven upper, unlocked Zoom in the forefoot and Flight Plate moderator, the XX9 looks and sounds as good on paper as any shoe. But, as we’ve seen with models like the KD VI Elite, packing a bunch of tech into one shoe doesn’t equal great on-court performance. The XX9 breaks that mold though, as Jordan Brand has unleashed a performance monster, and natural successor from the XX8. 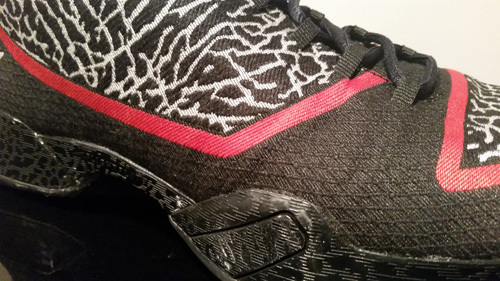 The biggest technological innovation in the XX9 was the Flight Weave upper. Designed to provide a custom fit while retaining strength during dynamic movements and giving engineers the ability to weave fibers tighter in high wear areas, it conceptual roots lie in Flyknit and Hyperfuse systems. You’ll find a tighter weave where more support is needed and a more forgiving weave in the rest – not unlike Flyknit. 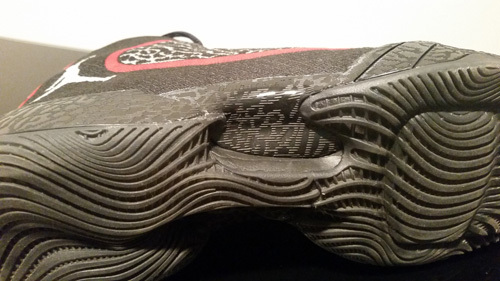 But where Flyknit uppers have a tendency to leave gaps when the shoe flexes, Flight Weave is hugging the foot at all times. Flight Weave is miles ahead of both of those textile technologies, and is one of my favorite uppers I’ve tested recently (along with the adidas’ Techfit-based Crazyquick 1 and Under Armour’s Clutchfit Drive). For comparison’s sake, it has more structure than the Crazquick 1 and fits closer to the foot with less shifting while moving around than the Clutchfit Drive upper. 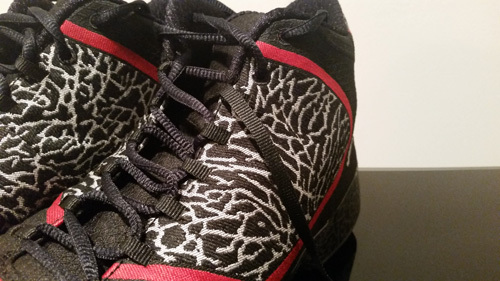 You can lace the XX9 up super tight from to toebox to ankle, and the fit is impressive. The upper fully hugs the foot and lockdown is vise-like. The internal heel counter provides good heel lockdown and I did not experience any shifting anywhere on the interior. 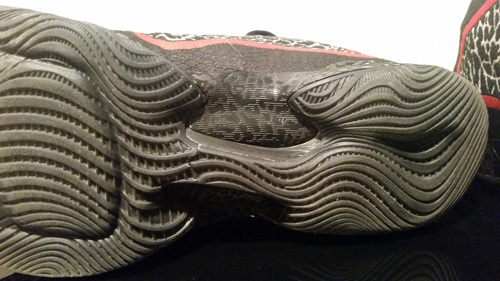 One major outsole change from the XX8 to the XX9 was the skinny bridge connecting the forefoot and heel. The XX8 was a true decoupled outsole – the heel and forefoot were independent parts – and that usually means transition isn’t as smooth. The connector on the XX9 remedies that some, but I wouldn’t consider heel-toe transition to be a strong point for the shoe. It gets better as you break it in naturally, but the large gap between heel and toe plus the slightly higher feel makes the ride less smooth than some other shoes. For what it’s worth, I had been playing in the Clutchfits, which are as smooth as it gets, so the difference in transition may be more apparent to me than you. The XX9 drops the heel Zoom unit and uses standard Phylon. Honestly, it probably plays a little better and more stable this way, though I thought the heel Zoom of the XX8 was just fine. You’ll get good impact protection and a consistent feel in the heel. I was a little disappointed in the lack of responsiveness of the forefoot unlocked Zoom. It’s not bad at all, but didn’t seem as bouncy as the XX8. This is because the Zoom bags have been recessed slightly into the midsole, so as to avoid the popping issue that plagued so many pairs of the XX8. The Zoom bags have also been laid horizontally, but I didn’t quite notice the energy return that I did in the XX8. Since the Zoom bag extends so far up the forefoot, I felt like there was a little dead zone right at the toe where the top flex point was. It wasn’t anything major, just an odd feel to go from Zoom to straight midsole at that specific flex point. That is all a little nitpicky though, because the responsiveness is still very good. As far as court feel goes I prefer my shoes to ride a little lower to the ground, and with the Flight Plate/Zoom combo there’s a little more midsole bulk than I’m used to. The upper fits so close to the foot that it feels a little funny to have that substantial of a midsole there. Support is fantastic with the sculpted Flight Plate providing plenty of midfoot structure while still remaining flexible. Overall the cushioning setup is very good, if not great. The outsole features anatomical sculpting in the heel and forefoot, and uses a full-lenth vertical wave pattern with some recessed horizontal sipes. The courts I typically play on are usually average to slightly above average in condition and I’ve had no traction issues. I’ll still get the familiar squeak on quick pull-ups. 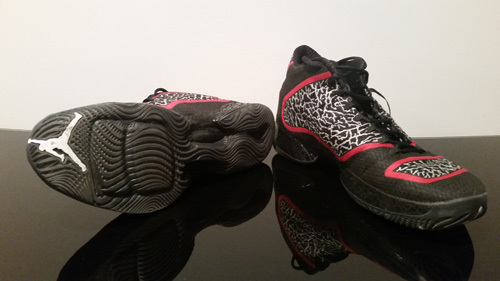 I had no issues initially with the XX9. I wondered how the woven upper would hold up when getting stepped on and pushed to the limits on court, because it is softer than I had expected. But I’ve put it through several league and general pickup games, gotten stepped on, and have seen no signs of wear. The build itself is high-quality, free of glue marks or loose strands on my pair. I expected them to hold up for months, until just yesterday when I was playing in a competitive league in central Indiana. As I unlaced after the win, I realized one of the eyelets – which are simple loops that attach to the midsole – ripped out and left me without a proper way to lace them. Back to Nike they go for a voucher. 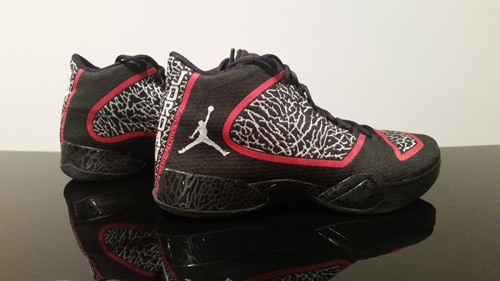 With a price tag of $225, I was expecting the Jordan XX9 to blow me away. It’s got the lineage of 28 other shoes riding on it, and is the flagship model for the entire brand. So was I impressed? Yes – the Flight Weave upper is one of the best I’ve played in, and the shoe is great from a comfort and support standpoint. Was I blown away? By some aspects, yes. I tweeted after my first couple of runs that I was kind of underwhelmed by the XX9 and a lot of that is tied to the lack of responsiveness underneath and average heel-toe transition. 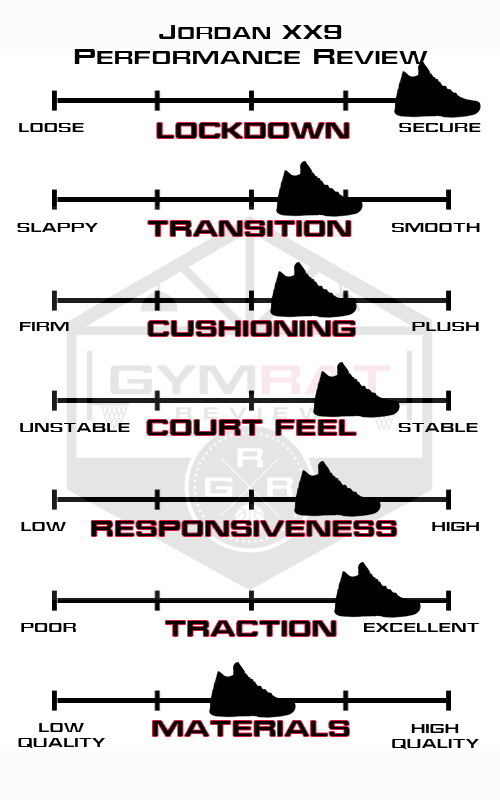 But the responsiveness is still above average and the transition improved some with multiple wearings, and I really do like playing in the shoe. If you have the funds and are a serious hooper, it’s certainly worth a try. I feel like I have undersold it, but I feel that it really is a great shoe – one of the better shoes of the year. It’s painful at the register for sure. I guess I lucked out in the end with that lace loop blowing out, because I’ll get a voucher back and be able to get another pair for review – hopefully CP3 VIII. $225 will damn near get me two pairs. Hey man! Nice review. What do you think is more durable traction-wise? The translucent one or this set up in the review? Because I am really skeptical about durability especially for a 200$ + shoe. Thanks man – I guess I always prefer the solid rubber outsole, but it shouldn’t be a different compound as far as the stickiness or durability goes. I know some people think that translucent is always more slick but I can’t speak to that. I’m trying to think if I’ve hooped in a translucent outsole before, and the only one off the top of my had is the Rose 5 I’m in now. It’s partially translucent underneath but I don’t think it’s any different. 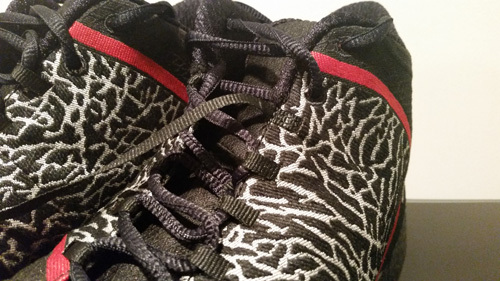 The KD VI Elites I tested had translucent outsoles and traction was fine there. I wouldn’t worry about it too much. Jake — I’ve been following your reviews for a while. Really appreciate your style and attention to detail. Anyway — I’m curious what size you went with on this model. I think you and I are the exact same size actually. I’m an 11-11.5 and more often opt for the 11 to get a bit closer fit. I felt like the XX9 was roomy enough that an 11 gave me a little bit closer fit. Again, just curious what size you reviewed. Thanks! Thanks man – great to hear. How does xx9 fit comparing to kobe 8? I have kobe 8 size 9.5. Should I get same size on xx9? My personal preference was the Clutchfit. Both shoes locked you in like crazy but I think with the way the Clutchfit midsole and cushioning system worked with the upper, it was a more natural fit and feel on foot. I also thought the Clutchfit was better in terms of responsiveness, as it was definitely smoother and lower to the ground through each step. Am I the only one that can’t wear the new weave Nike shoes? They are incredibly slim. With an athletic sock on it felt like I had Boa constrictors on my feet. After about an hour of wearing around my home, I had to take the shoes off. Waaaaaay too tight. I like the shoe, but it just doesn’t fit me. Clutchfit or Zoom Soldier 8?? Or these? Have heard these are crazy comfy, is that true? They’re pretty good, check the cushioning section of the review. Upper is a really nice fit, didn’t like the midsole setup quite as well as the XX8 though. I bought these and then returned them. The flight plate at the arch dug into my low arched feet, it didn’t cause me any blisters, but do you think that was just due to the flight plate not breaking in yet? I would think that after awhile the plate should be a bit more pliable with all that weight and force you put down on the shoe. 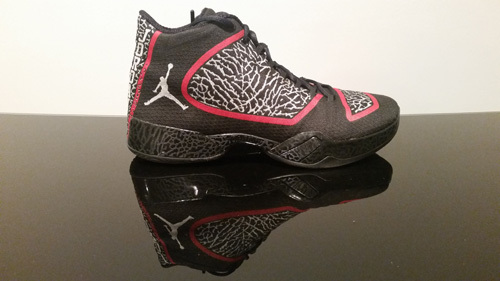 I really want to get the shoe again, any suggestions to sway me either way on the xx9 again? They’re just on clearance now that’s the only reason I’m reconsidering the shoe. I’d have to say I’m an advocate for all jordan performance shoes as they have not let me down in any of my league or pickup games. As I’m in my 30’s now I just need shoes that have cushion and feel low to the ground. I might just bite the bullet and pick them up. Thanks for the insight. Yeah Jake, I know what you mean. The SF2 and Sf3 have been my go to. Honestly the sf3 feels better in the cushioning department but I just really enjoy a woven upper. Not sure if you tried the brandblack j crossover 2, but thats a great shoe. Just wondering if you went with the same size in the XX9s, as your Clutchfit Drives? Went with an 11 in the XX9, 11.5 in the CFD. I have a narrower foot so in the woven uppers I always go down a half size to reduce some of the dead space. Hey man, I have the J Wall 1 and the Kobe 9 EM both size 8.5. The J Wall 1 fits perfect on me and the Kobe 9 EM fits a little tight. Do yout think that it’s better for me go with the Jordan XX9 size 8.5 or 9? Thanks! Nice, man! Thanks a lot! Man, I bought the xx9 infrared and I loved. Very light and the traction is great. Do you think the this solid rubber will burn quickly If I play on outdoors?